Envision biting into a warm juicy burger with all the trimmings. If you are a burger fan, your mouth may already be watering. If you are a vegetarian or animal welfare advocate, however, you might be rather disturbed by this imagery. Now imagine that as you are still chewing a bite of that same burger the server tells you that this beef burger was grown in a plastic dish in a stem cell lab. No cow involved! Would you have a beef with such a bioengineered burger? Or celebrate the fact that no cow lost its life to make this burger? Can we even call this test tube meet “beef” and would a vegetarian eat it? We had better start thinking about such questions because laboratory grown meat produced from stem cells is already a reality with the first stem cell-based lab grown “test tube” burger having been fried up and even eaten. The advocates of these bio-burgers prefer the term “cultured beef”, which conjures an image in my mind of a cow in a tutu doing ballet at the Bolshoi. Whatever you call it, laboratory grown meat produced from stem cells is just one of many stem cell-based endeavors based on outside-the-box thinking. 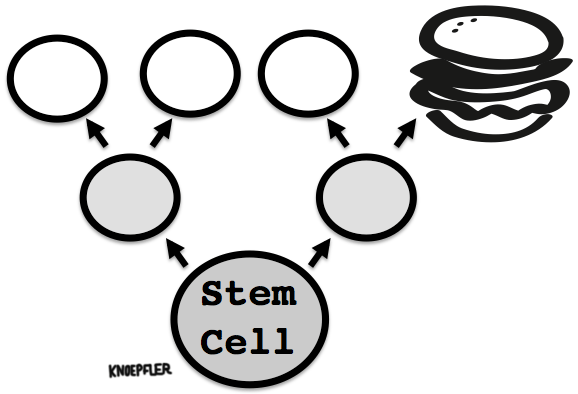 I have dedicated one chapter of my new book, “Stem Cells: An Insider’s Guide” to discuss stem cell burgers and other mind-blowing innovations that allow one to get one’s stem cell geek on. When it comes to stem cells, non-fiction is becoming more interesting than fiction with developments underway or planned including not just stem cell burgers, but also stem cell-based de-extinction and entire organ replacement. Getting back to the burger, researchers created it by assembling sheets of test tube meat grown from stem cells into a single “schmeat” five-ounce burger at a total cost of more than $330,000 or approximately $1 million/pound. Schmeat, a portmanteau of “sheet” and “meat”, is one of the terms coined for the bioengineered meat. Google co-founder Sergey Brin picked up the tab for this test tube burger at a price tag that was 100,000 times more expensive than a typical fast food burger. The only connection between this burger and an actual cow was a relatively small number of stem cells that had to be sourced at some point from living cow muscle. In principle the same technology can easily go beyond beef. It simply would depend on stem cells being available from any given species. The sky, or shall I say barnyard or forest, is the limit when it comes to the possible types of stem cell engineered meats and fast food products that could made in the same manner in the near future. The stem cells involved could be of a variety of types ranging from muscle and fat stem cells to so-called pluripotent stem cells that can make essentially any type of cell. In fact, the inclusion of both muscle and fat tissue in a burger would likely make it tastier. Nine years ago the first mammal, Dolly the sheep, was cloned. Snuppy, produced in 2005 by controversial Korean stem cell researcher Hwang Woo-Suk, was the first dog cloned. We now have the possibility of a cloned pork or beef hotdog made from stem cells becoming a reality in the next few years. Woo-Suk is also involved in a de-extinction effort to clone actual living Wooly Mammoths. In principle one could even grow such “delicacies” as abalone meat, rhino horns, tiger parts, or shark fins entirely in a lab from stem cells, perhaps saving endangered or threatened species. Some have even raised the disturbing possibility of making human meat for consumption by people from human stem cells. Would this be a high-tech form of cannibalism? In theory, one could even make burgers from a consumer’s very own stem cells creating a new form of autophagy (self-digestion) that cell biologists never imagined. You could have yourself and eat it/yourself too. Beyond mind-bending ethical issues, more immediate concerns about stem cell produced meats relate to safety issues. A safety mantra is drilled into the minds of researchers from day one of their careers: do not eat in the lab! Therefore, for many biologists the idea of eating something actually made entirely in a lab seems on first glance, well, crazy. Labs can have all kinds of viruses, chemicals, and other hazards. On the other hand, test tube food would likely be manufactured in so-called “clean” labs of the same kind designed for producing stem cell products intended for human use. Such labs are likely infinitely cleaner and safer than your average cattle ranch and butcher shop. Still I found it concerning that the team that made the first test tube burger served it right up to human taste testers and downplayed safety concerns in videos of the tasting that were on TV. The rationale for lab grown meat is to create a new, more ethical and sustainable reality of food production. In this envisioned future, meat would come from labs grown by researchers from stem cells rather than from farms grown by farmers from animals. Hypothetically the goals of increasing environmental sustainability and promoting animal welfare are noble, but I just do not believe that lab grown meat is the way to achieve these objectives any time soon. Beyond the safety concerns of lab-produced meat, there are other pesky issues too such as the reliance on the use of Fetal Bovine Serum (FBS) to grow the meat cells. The fact that meat stem cells require FBS to grow undermines the argument for animal welfare as a rationale for lab-grown meat because FBS is a product made by draining the blood from cow fetuses. Not a pretty picture. Another important question is whether it even makes any sense at all to produce meat in a lab for human consumption. As it turns out the nutrient rich broth, which we call “media” in the stem cell field, that must be used to grow the cells to make the schmeat is likely just as healthy or healthier for people to consume than the meat itself. The media is full of amino acids, vitamins, and other goodies making it an Ensure-like beverage that would be far easier and cheaper for people to directly drink rather than using it indirectly to make synthetic meat. Meanwhile, others are working feverishly on meat simulants that are entirely vegan in nature. Still others are focused on producing affordable complete nutrient products, such as Plumpy’nut, to more directly fight malnutrition around the world. This highlights one of the primary criticisms of synthetic meat. Opponents assert that it will never be cost effective. I hope that decades in the future, lab-grown meat will become a practical, safe, and even cost-effective reality as an alternative, more environmentally friendly food source, with the technology having ironed out the problems I mentioned earlier. The proponents of cultured meat made from stem cells would be wise to address safety and other practical concerns more openly as they proceed with this line of work. Meanwhile, we can imagine ordering a Mammoth Burger in a future that is something of a wacky mash up between The Flintstones and The Jetsons. The teenager working the cash register at our favorite burger joint in that reality will ask us “You want fries with that?” without batting an eye, understanding implicitly that we want not just a really big burger, but one made of actual cloned Wooly Mammoth meat grown in a lab from stem cells. This piece was first published last week on Sciam. I imagine about 600 million years ago a committee of single celled organisms gathering around in a warm lagoon at some nice tropical location. After more than 3 billion years of evolution they were wondering, “What next?” Then one of them said, I know, let’s make a body….